The Fidalgo Island side of Deception Pass is remarkable for the rocky headlands jutting into the waterway. One is called Lighthouse Point. The rock is volcanic, evidence of the fiery origins of many islands in this area. Both the swift currents and these stony points can make transit a hazard for boaters. 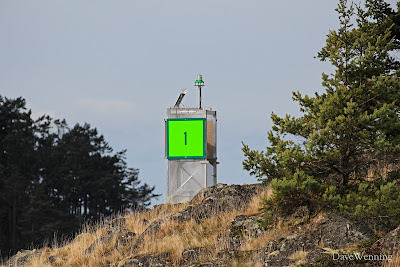 The little navigation light in the upper-left corner of the photo has the job of guiding watercraft safely through the pass. 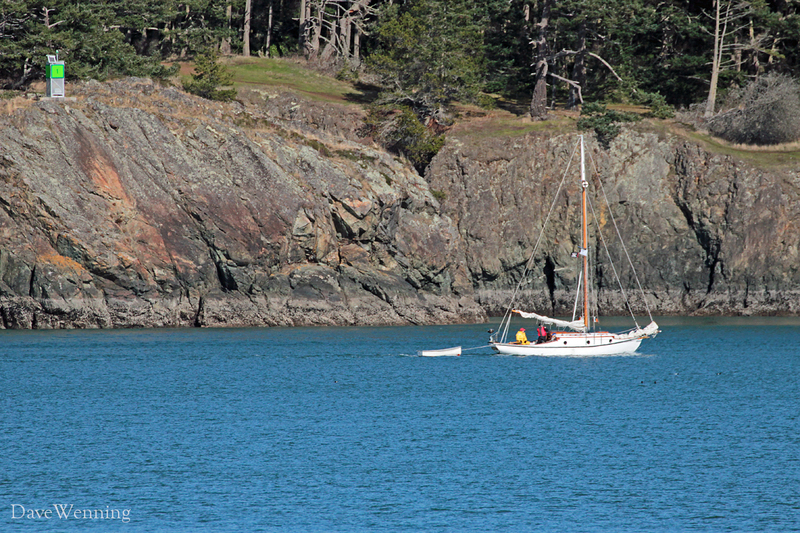 Lighthouse Point can be visited by following the trail that begins at Bowman Bay in Deception Pass State Park. The Lighthouse Point trail begins at the Bowman Bay parking lot. Head south past the fishing dock to find the trail head. 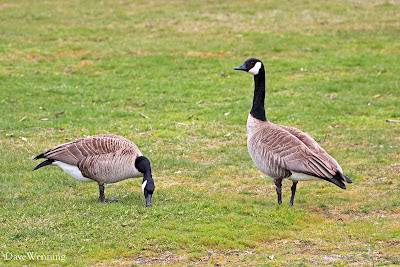 I was seen off by a pair of Canada Geese. The gander on the right gave me a look that said, "come one step closer and you'll regret it." The trail begins with a steep climb with switchbacks. Very soon, it levels off along the cliffside, then descends back down to the beach. The rest of the way is an easy hike. 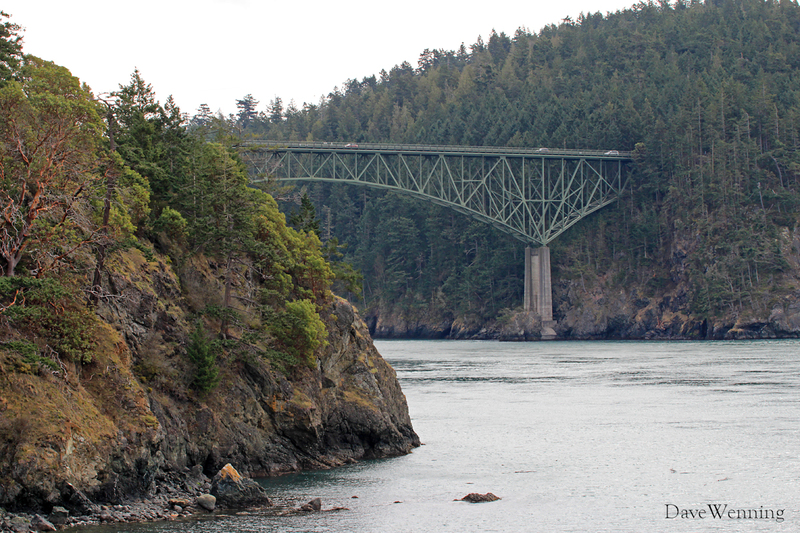 Halfway along the trail, the Deception Pass bridge comes into view. 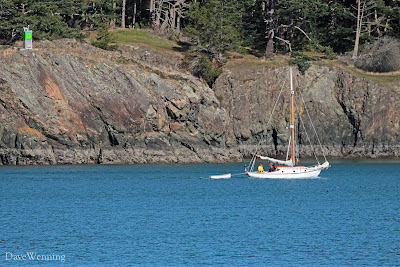 On the left is Lotte Point, another of the Fidalgo headlands at Deception Pass. Upon reaching the grassy top of Lighthouse Point, I found native wildflowers blooming. 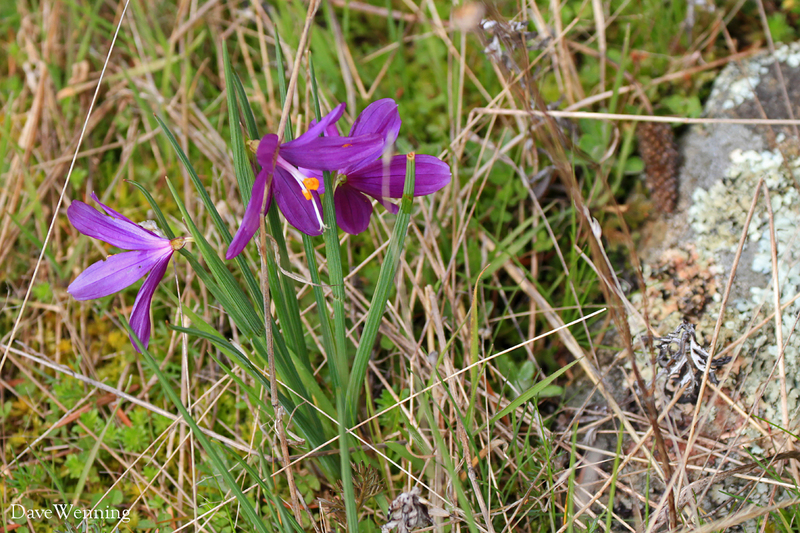 On the left is Douglas' Blue-eyed Grass (Sisyrinchium douglasii) a member of the Iris family. It made little purple patches all over the grass which announced, "stay on the paths." It likes the growing conditions here which is basically wet in the spring, and very dry through the summer. 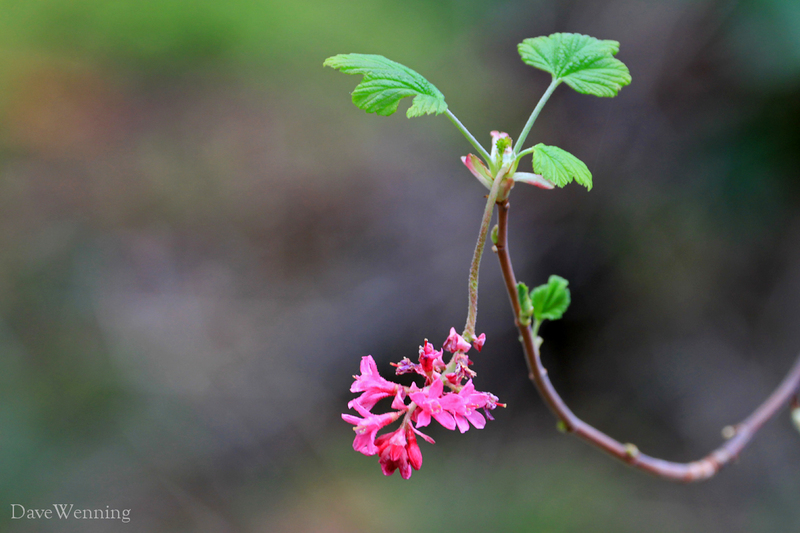 On the right is Red-flowering Currant (Ribes sanguineum) a very attractive shrub which was growing at the forest margins and along the trails. The same plant is available at nurseries. It makes a terrific, early-blooming, low-maintenance addition to the wildlife garden. At home, I have some that have come up wild in the yard. At Lighthouse Point, the navigation light actually sits on a small island of stone separated by a deep chasm. It is not possible to walk up to the light. I have been told there once was a real lighthouse tower here. 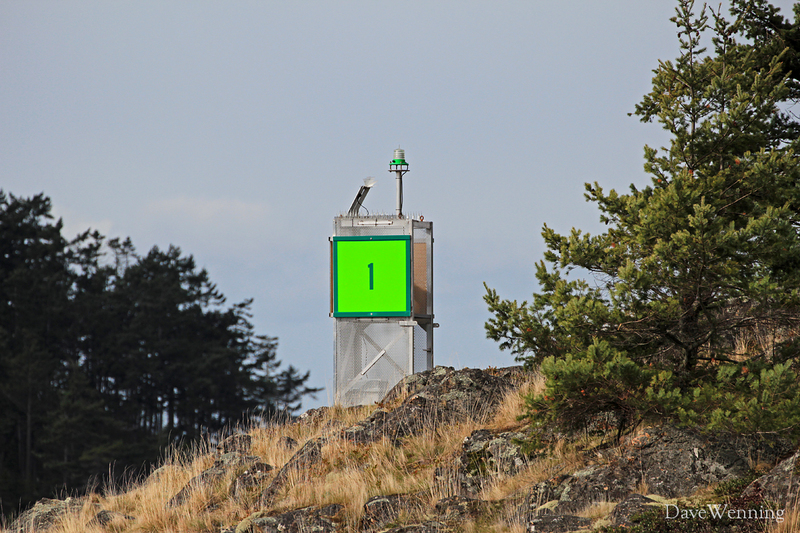 I do love lighthouses, but in the case of Deception Pass, its removal may have been for the best. The little light serves its purpose without detracting from the grandeur of this spectacular setting.